The University of Bath and Avon Fire & Rescue Service (AF&RS) have teamed up to run a live multi-story building training exercise. Firefighters from Avon Fire & Rescue Service on campus as part of the live drill that took place on Friday 26 October 2018. ‘Operation Peregrine’ took place earlier today, Friday 26 October, at the University of Bath’s Claverton campus between 10 and 11.30am. 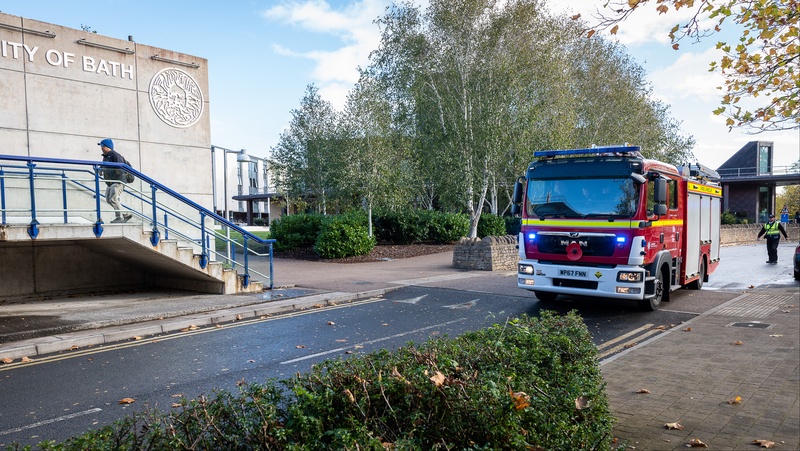 Between 25 and 30 firefighters and six fire engines from Bath, Kingswood and Radstock stations took part in the drill working with colleagues from the University’s security, estates and accommodation teams. The first of its kind, the drill took place on the ninth floor of the University’s Norwood House building where firefighters were challenged to put out a kitchen fire and rescue mannequins from the building. Like any other practice fire alarm drill at the University, Norwood House was temporarily evacuated with the University and AF&RS’s colleagues working side by side to ensure staff and students were safely evacuated from the building in question. The University also used this as an opportunity to engage with its student and staff community, providing the latest fire safety messages and advice about what to do in the event of a fire. Members of AF&RS were also present to speak with students and staff, to provide advice and answer any questions. Kitchen fires in student accommodation, especially at the start of the academic year, are something we want to help reduce. Call outs are normally avoidable and are a drain on valuable resources that could be better used elsewhere. Demonstrations like this show the amount of work that goes into even a small fire on upper floors of a multi-storey building. It also allows us to practise our procedures in collaboration with the university, highlight any concerns and provides valuable knowledge to students in the area. As a University, the safety of our students, staff and visitors is paramount and we take fire safety very seriously. This is an important initiative to test our systems and ensure we are prepared for worst case scenarios. We welcome the opportunity to work with Avon Fire & Rescue Service to promote fire safety, whilst providing the Fire Service with the opportunity to run a multi-storey building training exercise. Many of our staff are fire-trained and we regularly practise both evacuation and invacuation drills to ensure our staff and student community know exactly what to do in such an event. Each year, new and returning students are reminded about fire safety best practice and as part of this drill we have taken the opportunity to share fire safety messages with our community.